I have never used a loom before, but I would like to weave a blanket. Any advice on what loom to buy and what I will need to begin? The Schacht Flip, a rigid heddle loom. Loom choice goes according to a couple of factors; size, capacity, and price being the top 3. First, you can’t weave any wider than the width of your loom, so there’s that. You can (more advanced technique) weave double-width on a loom with at least 4 harnesses, or you can weave in panels and sew them together. Rigid heddle looms will handle at most about 4 1/2 yards of warp; but again, you can seam panels together. And then there’s cost: floor looms which will handle a full-width blanket without seams are thousands of dollars (seriously, minimum 4K for a wide one; again, seams are a possibility); but a small rigid heddle loom and a capacity to think modularly will bring the price down to $200-$300. And then there’s everything in between...you’ve asked a big question here! And after those 3 considerations, there is the amount of space you have available....there’s the rabbit hole to fall in! Give us a call at 800-441-9665 and we can discuss this further; it’s a question with a lot of parts to it. I am a new weaver (tapestry and rigid heddle) and I am thinking of moving onto a floor loom with a max. weaving width of 36". I have been thinking of the Louet David, but the price is somewhat steep, plus it is a jack loom. I want to do both tapestry as well as other fiber art and the occasional rag rug on it, but I am not sure if a jack loom is suited for tapestry weaving. 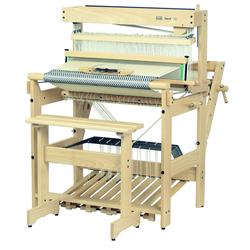 I already have a couple of upright or frame tapestry looms, one of them being a 22" Mirrix. The reason I want to go for a floor loom is to weave a wider width and to weave something more than tapestries. I looked at the Mighty Wolf but was told that the tension isn't great on it. Another reason for wanting to do tapestry on a floor loom is to give my shoulders a break. Any suggestions? Come on over to the dark side… we have cookies! Let’s talk first about what looms do what things best. Tapestry is a very visual and painter-ly thing to do, and having it in front of your face is important; that’s why most tapestry looms are vertical or in an easel rather than horizontal; it’s easier to see what you are doing. This is not to say that you can’t do tapestry in a horizontal plane (a jack loom), but it does add to the degree of difficulty in seeing what you are doing accurately. A good rug is one that lasts and wears well, and in order to do that, it needs to be woven under pretty high tension and with a very firm beat, and that implies a VERY sturdy loom with a lot of lumber and mass behind it; weaving rugs has destroyed less-sturdy looms. You can certainly weave a rug-shaped object on a less-sturdy loom, but it won’t last and wear well. So what we have in your 2 stated desires are 2 wildly varying looms, neither one of which is the David, it not being either heavy enough or vertical. There is no inherent reason not to weave rugs on a (heavy) jack loom, and though a countermarche loom is optimal, it’s also very expensive. A heavy counterbalance loom is also a dandy rug loom though, and can be found used very reasonably. If you only want to do an occasional rug, a lighter weight loom will do it without too much complaint, but it’s not highly recommended. And vertical tapestry looms really are better. All that having been said, I think you need to look at a large studio space; you have wide-ranging interests! Let us know if there’s anything else you need; there are less expensive ways to do a lot of things, and the David is one of the more-expensive options. Serious tapestry weavers use the Gobelin from Leclerc, found here. If we’re dreaming, we might as well dream big! And honestly, there is nothing wrong with the Mighty Wolf unless you are married to the idea of a steady diet of rugs (I own one myself, and I’d never dream of being parted from it). If you can find a used Leclerc counterbalance (and they are out there, for $500-ish) to do your rugs, you can do everything else in your life except big tapestries on the Mighty Wolf, including fine linen towels. But ask around; you’ll find that I am not the only person with opinions! In our previous post, we shared a new section dedicated to sharing free projects for the Schacht Zoom loom (click here if you missed it!). Today, we want to introduce another new section where we'll share even more tips, tricks & project ideas! In our Free Printables section, you will find downloadable PDFs featuring tips, tricks and project ideas for spinners and weavers. As this is new for 2017, we have just a few PDFs to share thus far; rest assured, we will be adding more as the year progresses, so stay tuned!